Is it just me, or are the Heroes proving to be the dumbest tribe in Survivor’s history! Clearily the Heroes tribe is physically superior while the Villains tribe is smarter and more strategic, with that in mind, at tribal council tonight the Heroes vote out Tom and keep James with his leg injury. Duh! Take the physical power out of James and you got one big fat zero, not a hero! JT had the swing vote tonight, he gets the dunce cap with the big ‘M’ on it for moron. Colby came to the reward challenge strutting like a rooster, not wanting the sample of chocolate that Jeff Probst offered because he wanted to focus on his game and win the challenge. We all know what happens to arogant show offs, they lose. Next week, we are in for a little excitement when Russell threatens to take out Rob. I think Russell is going to get his head handed to him if he tries it. 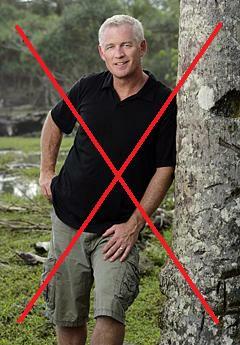 Survivor Hottie Boston Rob is down, but not out! Survivor’s Black Widow, Parvati, ensnares Villain Russell into her web!